SUKKUR (92 News) – At least 16 insurgents have on Thursday laid down their arms to Rangers. 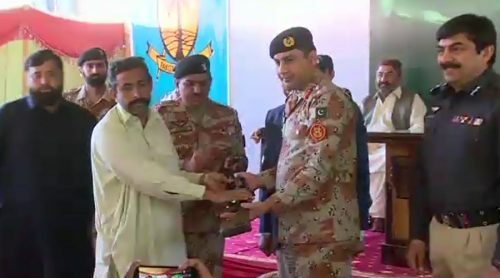 The criminals laid down their arms before Sector Commander Rangers Colonel Imtiaz, Commissioner Larkana Abbas Baloch and DIG Larkana Feroz Shah. The insurgents expressed desire to join national mainstream and work for development of the country. On the occasion, Lt Col Adrees said that the 16 men who laid down their arms had gone to Katchay area following a clash between their tribes and murder, attempt to murder and robbery cases have been registered against them.